Absolutely beautiful! So pretty! Merry Christmas & a Happy New Year to you! that spring will be coming before too long. Your art is a celebration of fantastic tangles. Cheers for a special Christmas. This is beautiful, I especially like the scrolls with music on at the bottom. Have a lovely Christmas. You really did a wonderful job and have included just about all my favourite tangles! Like Jenna, I particularly like the music scrolls - a lovely touch! You have so many well done tangles in this piece. I really love the scrolls like sheet music. Merry Christmas! Wow! Stunning piece! I love the combinations of tangles that you used for this one, and the hints of red through out! Happy Christmas to you! Jij ook de beste wensen voor het komende jaar. Mooie kaart/tekening heb je gemaakt. Voor jou ook! Wat een mooie kaart met uitzonderlijk leuke patroontjes bij elkaar. Mooi. Wat een prachtige kerstgroet! 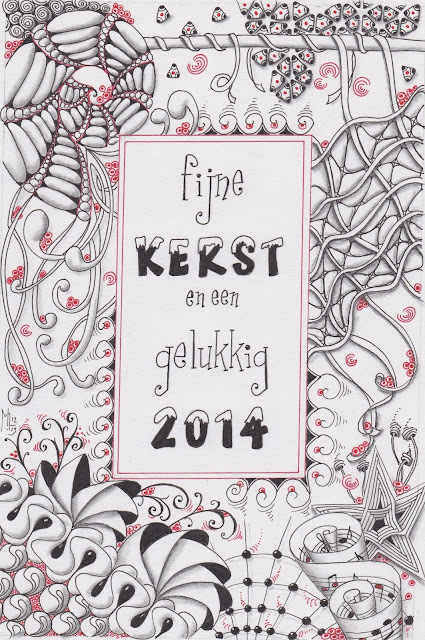 Ook voor jou hele mooie feestdagen gewenst en voor 2014 weer heel veel inspiratie. Gelukkig zie ik je binnenkort nog om weer door jou geïnspireerd te worden. Very festive. I like the touch of color. Beautiful piece with a lovely touch of color. Merry Christmas and a blessed New Year to you! A beautiful piece with wonderful sentiments for the season. May you have a joyous holiday and prosperous new year. Prachtig, een ander woord heb ik niet. Heeft de manier van werken van Michelle je geinspireerd? Ik vind dat zo mooi, hoe we groeien door naar elkaars werk te kijken. 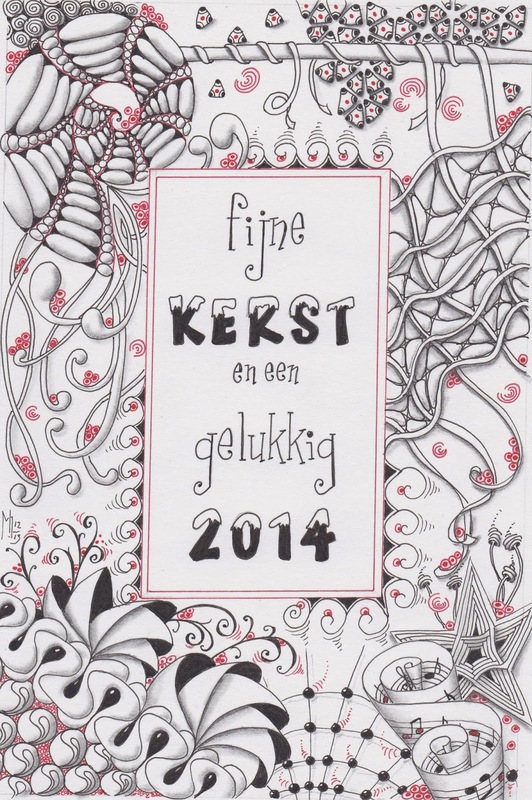 Mariët, ik wens je goede kerstdagen en een 2014 vol gezondheid, licht, warmte en liefde. Wonderful and festive! I like the touch of color! Merry christmas and a happy new year to you! very nice. Have a lovely Christmas season, and a wonderful new year. This looks like a wonderful celebration - love the music scroll at the bottom! Have a fabulous holiday. Heel fraai gemaakt! Zo in evenwicht! Kerst en Winter bij elkaar! Wat en mooie vrolijke kaart. I love your card, it has everything a card needs to give us a message of beauty!